In the years since the Mars Exploration Rover Spirit and Opportunity first began transmitting images from the surface of Mars, we have become familiar with the harsh, rocky, rusty-red Martian landscape. But those images are much less straightforward than they may seem to a layperson: each one is the result of a complicated set of decisions and processes involving the large team behind the Rovers. With Seeing Like a Rover, Janet Vertesi takes us behind the scenes to reveal the work that goes into creating our knowledge of Mars. Every photograph that the Rovers take, she shows, must be processed, manipulated, and interpreted—and all that comes after team members negotiate with each other about what they should even be taking photographs of in the first place. Vertesi’s account of the inspiringly successful Rover project reveals science in action, a world where digital processing uncovers scientific truths, where images are used to craft consensus, and where team members develop an uncanny intimacy with the sensory apparatus of a robot that is millions of miles away. Ultimately, Vertesi shows, every image taken by the Mars Rovers is not merely a picture of Mars—it’s a portrait of the whole Rover team, as well. "Offers fascinating insights into the work that goes on behind the camera, in terms not only of the production of an image, but also of the entire process that surrounds it, from how decisions about which image to take are made, to the calibration of images, colouring, etc. She describes interactions between team members, particularly the differing emphasis placed on images by scientists (who wish to understand Mars) and engineers (who don’t want to place the rovers at risk). The balance between risk and investigation was one that had to be adjusted every day, and the fragments that Vertesi offers of conversations during daily Science Operations Working Group team meetings illustrates the constant trade-off and negotiations necessary to ensure the success of the rover traverses. . . . A most entertaining read." "In Seeing Like a Rover, Vertesi tells us little about scientific results - what the rovers saw. Her interest lies elsewhere, in scientific practice - how the rover images were taken, calibrated, manipulated, annotated and debated, and what this tells us about the nature of planetary exploration. Vertesi is an ethnographer embedded in a peculiar world where humans and robots work as equal partners - Margaret Mead among the Starfleet. Seeing Like a Rover examines the structure and sociology of science, using the MER mission as exemplar. Its meticulous observations and commentary will reward those with a serious interest in how science gets done." "Fascinating. . . . Vertesi proposes a way of understanding image-making practices as a kind of teamwork: learning to see like a rover, here, is an embodied, skilled, social achievement. Building on Wittgenstein's notion of seeing as, Vertesi conceptualizes these imaging practices in terms of an analytic framework of drawing as: the Rover scientists 'use digital tools to draw Mars as consisting of different kinds of materials or surfaces, with implications for future viewings and for team relations.' From mapping Mars to robot funerals, it's a wonderful study for readers interested in space exploration, visual studies, sociology, and STS alike!" 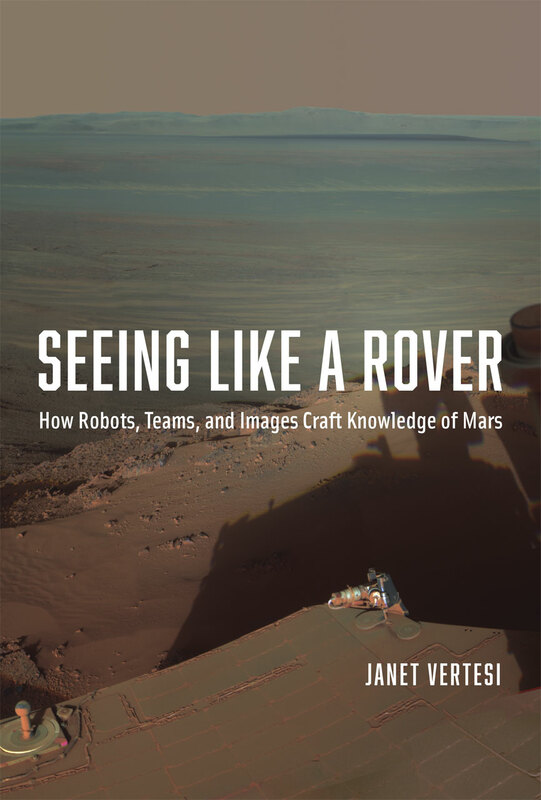 "Vertesi's account of the inspiringly successful rover project reveals science in action, a world where digital processing uncovers scientific truths, where images are used to craft consensus, and where team members develop an uncanny intimacy with the sensory apparatus of a robot that is millions of miles away. Ultimately, every image taken by the Mars rovers is not merely a picture of Mars--it's a portrait of the team as a whole." "Vertesi takes the reader into meetings of the rovers’ Science Operations Working Group, where the project team meets to plan the next day’s activities by the rovers. . . . A fascinating look inside how a mission operates." "Vertesi take us on a step-by-step journey through the image-making practices that produce those familiar reddish Martian landscapes. The outcome is a well-crafted, highly textured ethnographic account of how the team works with the digital images sent back by Martian rovers. "Since life on Earth is so hard, the utopian imagination likes to turn to space....In Seeing Like a Rover, Vertesi argues that Mars has already begun to make us better. The book presents itself as an ethnography of the researchers behind Spirit and Opportunity, the NASA rovers launched to Mars in 2003. Focusing on the rovers’ photographic mission, it describes the tremendous feats of collaboration and planning necessary to take pictures 140 million miles away." "Possessing the sensibilities of an ethnomethodologist of scientific work, Vertesi crafts her narrative without resorting to the specialized language that sometimes obscures ethnomethodology’s accounts. Vertesi tells her story and writes her theory of work in plain English. The result is a first-rate and detailed account of how scientists who work with images of Mars transform those images into credible knowledge. In the space allocated to a book review, I cannot hope to impart the wealth of details that one learns from Vertesi....What I hope I have done is whet your appetite to read an important and interesting new book. Seeing like a Rover will be of considerable interest to sociologists of science, organizational theorists, students of technology, and scholars of work and work practices. It is also an exemplar of what ethnomethodological sensitivities have to offer each of those audiences." "Vertesi has been embedded with the Mars Exploration Rover team for nearly a decade working to understanding the manner in which modern science and technology is advanced through collaboration, individual initiative, and the power of big questions. Seeing Like a Rover is an outstanding example of what may be accomplished by a talented sociologist asking sweeping questions and analyzing data both mundane and exciting." "Vertesi has written a compelling account of how the images of Mars secured by the rovers were planned and then transformed into scientific artefacts together with the host of conversations, meetings and decisions that went into these activities." "Janet Vertesi had a front-row seat for the Mars Exploration Rover project, and for the first time she brought a social scientist’s keen eye to the way we operate rovers on Mars. In Seeing like a Rover she doesn’t just describe how we did what we did. She gets inside our heads to describe why we did what we did, offering insights that wouldn’t have occurred to even the mission engineers and scientists ourselves. It’s a fascinating read." "Part academic ethnography, part exploration science and technology primer, and part just plain fun storytelling, Janet Vertesi’s Seeing like a Rover takes you deep inside the thoughts, hopes, and habits of the men and women who set out to explore the Red Planet through the eyes of a pair of high-tech robotic emissaries. As one of those explorers, I’ve relived many of the highs and lows of remote planetary investigation through her distinctly social, and sociable, lens. Vertesi places what many incorrectly perceive as a purely technological, asocial, non-interactive activity—robotic planetary exploration—squarely in the context of human behavior. Her analysis is thoughtful, insightful, and timely, and is sure to influence future explorers, human and robotic alike." "Vertesi’s powerful ethnography and the clarity of her thinking make Seeing Like a Rover a most thought-provoking milestone in the field. It is a thoroughly enjoyable and inspiring read, which shows how powerful sociology can be when it analyzes the production of hard science."